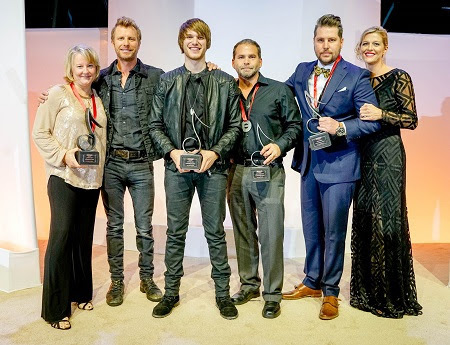 NASHVILLE, Tenn. (October 31, 2016) – Performing rights organization SESAC awarded Song of the Year to hot country newcomer Michael Tyler during its Nashville Music Awards for the Dierks Bentley smash “Somewhere on a Beach.” Bentley presented the award to Michael Tyler, who co-penned the multi-week No. 1 platinum-selling hit. “This is awesome and I’m so thankful for this honor! Wow, I can’t believe this has all happened in the last year. I’m so blessed that Dierks decided to record the song and then release it as a single,” Michael Tyler said. MT co-wrote “Somewhere on a Beach” with Jaron Boyer, Alexander Palmer, Dave Kuncio and Josh Mirenda. The Reviver Records recording artist’s debut single “Crazy Last Night”, which world-premiered on CMT, was selected as Billboard’s Country Songs of the Summer Picks. MT is on the road with Mercury Nashville’s Canaan Smith for the Sundown Ready Tour and will join Reviver Records labelmates LOCASH for Live Nation’s ‘Ones To Watch’ Tour. Fans can purchase tickets at themichaeltyler.com. Follow Michael Tyler on Facebook, Instagram and Twitter or visit TheMichaelTyer.com. For more information on Reviver Records, visit revivermusic.com. Nov. 05 Rusty Spur Saloon – Ft. Wayne, Ind. Nov. 10 The Single Barrel – Lincoln, Neb. Nov. 17 Mercury Ballroom – Louisville, Ky.
Nov. 18 Deluxe at Old National – Indianapolis, Ind. Jan. 05 Terminal West – Atlanta, Ga.
Jan. 06 House of Blues – Lake Buena Vista, Fla.
Jan. 07 House of Blues – North, Myrtle Beach, S.C.
Jan. 13 House of Blues – New Orleans, La. Feb. 08 House of Blues – Boston, Mass. Feb. 09 Irving Place – New York, N.Y.
Feb. 10 The Fillmore Charlotte – Charlotte, N.C.
Feb. 11 The Ritz – Raleigh, N.C.
Feb. 17 Theatre of Living Arts – Philadelphia, Pa.
Feb. 18 The Fillmore – Silver Springs, Md. Feb. 25 St. Andrews Hall – Detroit, Mich.
May 18 House of Blues – San Diego, Calif.